Combining GW 501516, MK 2866, MK 677, LGD 4033, RAD 140, and YK 11. BEAST sarm’s is the strongest bulking sarm on the market. SKU:beast Category: Uncategorized Tag: Musclegen Research Brand: Medfit RX. 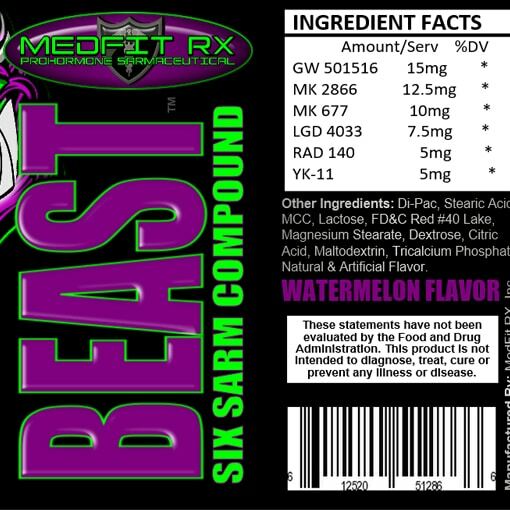 Buy MedFit Rx Beast sarm’s supplement, a 6 compound sarm’s stack designed for maximum muscle mass and strength gains. Combining GW 501516, MK 2866, MK 677, LGD 4033, RAD 140, and YK 11. BEAST sarm’s is the strongest bulking sarm on the market. If you are looking for maximum gains you need to check out BEAST by Medfit Rx. ANY ITEM FROM MEDFIT YOU ARE TESTIFYING THAT YOU ARE 18 YEARS OF AGE OR OLDER.